Update 3/13/11: More pics from Bill. Update 3/12/11: Not your usual resale tale here. 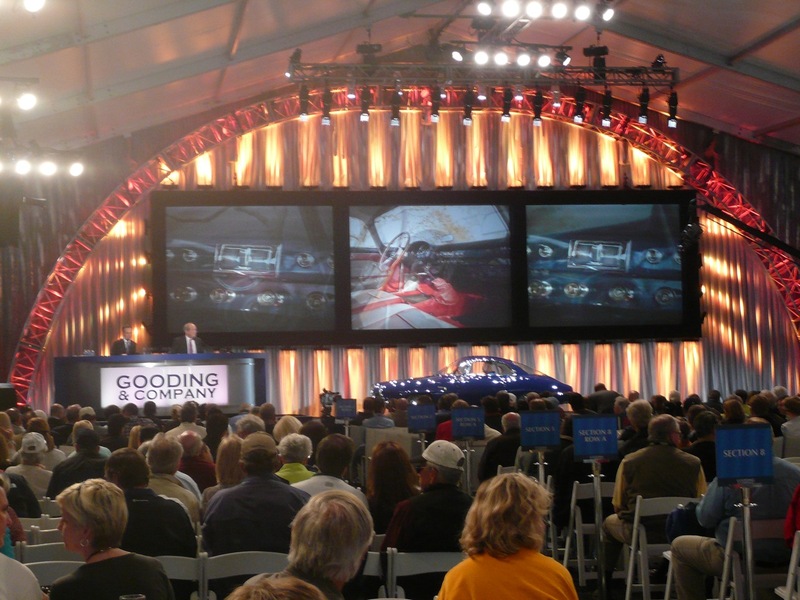 This car sold for $140,000 + 10% at Amelia Island. Buyer was the Malamut Auto Museum in LA. Thanks for the tip Eric! Anyone have pics from the auction to share? Oh, and congrats to the seller on a big cha-ching. A nice one from Bill Gillham, the restorer, who is no doubt proud of his work. From the sellers own hand as the bidding passed the estimate. management that their ideas had merit for a wider audience. the finest SS on the continent” – and the results of that effort can be clearly seen today. clamps hold the hoses under the hood. their light patina giving a graceful touch. National Convention in Fredrick, Maryland. 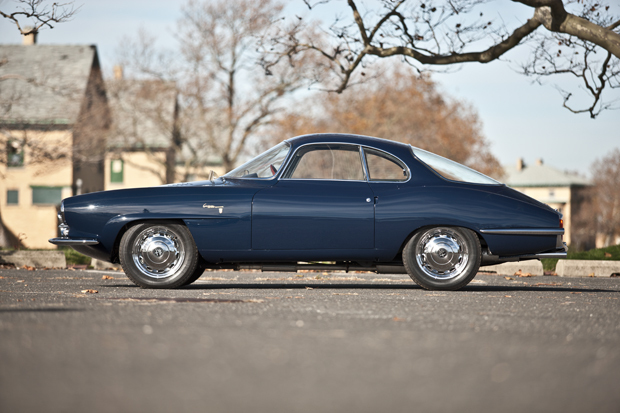 1960 Giulietta Sprint Speciale 00120*00388. This car is available in Houston here right now for $69,900. If I have my information correct this car was restored by Bill Gillham, who has been a prominent voice in Alfa enthusiast circles for years and knows his Giulietta’s (and incidentally, he welded the floor in my 59 Sprint). No engine number is given and no pictures of it are among the pictures on their website. I would want these and underside pictures for starters if I was seriously considering this car. This dark blue is my favorite color for the Sprint Speciale and the red/gray interior is the perfect compliment. If this car was originally this color combination it is rare indeed as most were red or white. Exceptionally straight panels covered in very nice paint. Trim all looks straight and fits the car very well. The front bumper looks a little heavy from this angle. Is that drip on the nice clean pavement from this car? Car sits a little lower than stock. Wheels are chrome which is common on later cars, I prefer the painted silver look which sets off the hubcaps nicely. 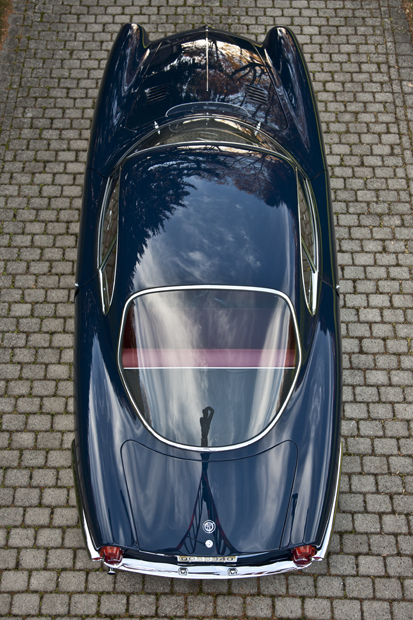 Lines of the reflection in the paint leads me to believe the body is very straight and the paint work is very nice. I’d like to see this sticking out of my garage! Amber lenses were used on European market cars. From this angle the wheels almost look like they were widened. Chrome side spears and bumper look to fit the car very well. Lack of badging means everyone has to ask what it is. Even given a glimpse of the ‘Giulietta Sprint Speciale’ and ‘Bertone’ badges on the sides, a look of bewilderment usually follows an attempt to pronounce its name. Interior looks great. I’d opt for red mats to try and calm down the color shifts but this is no big deal. I like the Nardi wheel, but would want the correct wheel in a box on my shelf. The red and gray material used on this car might be the exact same as used in my red Sprint. Seats look good, not over-stuffed. Red piping on the front edge of the lower cushions usually goes diagonally out to the corners but I could live with it this way. Rear parcel area is nice and tidy with correct luggage securing strap eyelets intact. The presentation on the sellers website tells me they have very little experience with vintage cars, maybe the owner of the car owns the dealership. Whatever the case, there should be a lot more information about the car. If I didn’t already know about the car my comments would probably be a little more skeptical, though the pictures do tell a good story. This car is among the nicest restored Giulietta SS’s and will probably be on a cargo plane to Europe or the Middle East within a few weeks to disappear in to someone’s collection. If I had the cash I’d spring for it, but alas it’s not for me just yet. This entry was posted in 10120 Giulietta, Giulietta & Giulia Market, Restored Cars, Sprint Speciale's and tagged cars, Classic cars, Italian cars, Vintage cars by Hamilton. Bookmark the permalink. Just wanted to say thanks for your posting, without which I never would have known about this car. It’s in my garage now (East Coast USA). Your blog is really a pleasure to visit, with great organization, content and visuals. Hope you have the energy to keep going. I know the owner of this car and you are correct that the dealer that had the car knew little about the car/vintage cars. 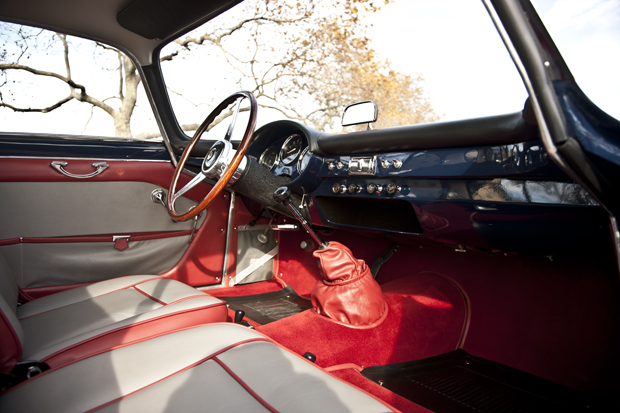 The car had undergone a complete restoration by Gillham and then a complete mechanical rebuilt and sorting out. In fact the car had so few miles on it that the head hadnt been re-torqued yet since the miles on the new engine was so low.